A few of the projects we are or have worked on are described below. If you’re interested in joining the group to work on these or other fault mechanics topics, get in touch. In conventional models of frictional sliding, faults slip in one of two ways. Cold, shallow faults slip episodically in earthquakes, and warm, deep faults slip slowly and steadily. But in the past few decades, observations have revealed that many faults slip show an intermediate behaviour: slow slip events. In slow slip events, initially accelerate but then puzzlingly stall well before they start generating large seismic waves. Currently we are studying some large (300-km-long) slow slip events which rupture the subduction zone plate interface in Cascadia. In these events, the fault mostly slips slowly, at rates around 1 cm/day, but the slip triggers millions of tiny earthquakes. Postdoc Baptiste Gombert is currently identifying those earthquakes in order to determine which part of the fault is slipping and how the slipping location evolves through time. We will compare the spatial growth of a number of slow slip events with models of fault slip in order to determine which fault zone process drives slow slip. For instance, in one model, changes in fluid pressure in the fault zone pull the fault tightly shut when it tries to slip quickly. Such a model predicts a strong resistance to rapid slip and would predict a limited range of slip and growth rates, while other models, with less resistance to rapid slip, would allow a wider range of slip rates. Slow slip events are not the only type of slow earthquakes. 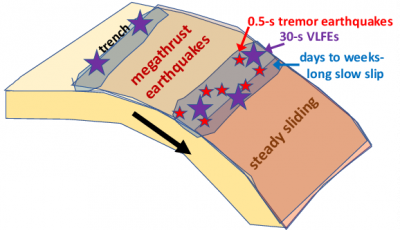 There is a whole spectrum of events, including month-long slow slip events with slip speeds of 10-7 m/s, 30-second-long bursts of slip with slip rates likely around 10-5 m/s, to 0.5-s-long tremor earthquakes with slip rates around 10-3 m/s. All of these events are slower than earthquakes, but we don’t know why. One possibility is that the various types of slow earthquakes are all governed by the same physical process—that they’re scaled versions of each other (e.g., Ide et al, 2007). But many of the physical process proposed to explain slow earthquakes can produce only a limited range of slip rates. The processes can’t produce a wide range of slip rates, and certainly can’t make much higher slip rates in smaller events, as seem to be observed. If we can confirm that slow earthquakes are indeed part of a continuum of events, we can narrow down the plausible models to those processes whose properties depend on fault size, like pore pressure changes or brittle-viscous flow. Our group has been investigating the slow earthquake spectrum in a variety of ways. In one approach, we have been examining the variations in slip rate in large slow slip event. 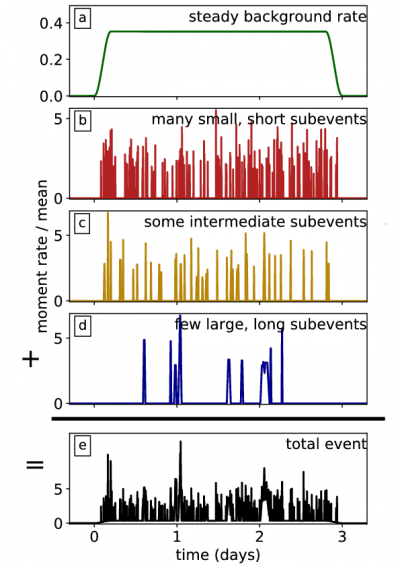 We showed that the observed variations in slip rate could indeed be produced by a collection of smaller events, all of which are scaled versions of the first one. As seismologists, we record the shaking of the surface of the Earth that is produced by earthquakes at depth. We can use the duration of that shaking to infer the earthquake duration: how long slip lasted. But to understand the dynamics of earthquake rupture, we also need to know the size of the region that slipped. We have been developing a new technique that allows us to estimate the rupture extents of small earthquakes. We note that as different locations within an earthquake slip and generate seismic waves, those waves require different amounts of time to travel to the recording stations. The varying travel times result in different seismograms at different stations, and we use those differences to back out the rupture area. 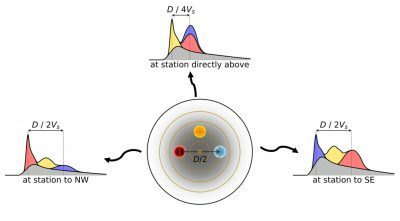 We have used this technique to show that the small earthquakes that create tremor-like signals in California likely rupture more slowly than “normal” earthquakes. Graduate student Josh Williams has developed the technique to analyse stress drops in earthquakes on the Blanco Transfom Fault, several hundred km offshore western North America.